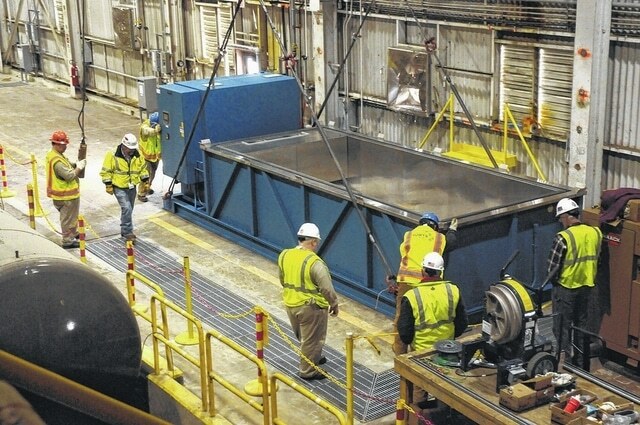 Crews set the first of four “cold boxes” at a feed facility at the former Portsmouth Gaseous Diffusion Plant. The cold boxes are used in the process to transfer Uranium Hexafluoride (UF6) gas from heavy-heel cylinders into new UF6 cylinders. This enhanced process improves the efficiency and output of recovered UF6 in a uranium barter program that supports cleanup funding. Last week, the United States House of Representatives and Senate approved a $1.1 trillion spending bill. Included in the bill is funding for continued Decontaminating and Decommissioning (D&D) operations and the American Centrifuge Plant (ACP) in Piketon. On Sunday, Dennis Carr, Site Project Director for D&D Contractor Fluor-BWXT sent a memo to employees addressing funding. In the $250 million allocated for D&D $203 million is allocated towards operating and just under $22 million for capital projects. The capital dollars would go towards the construction of an onsite waste disposal facility. “While the requested funding for the Onsite Waste Disposal Facility was significantly reduced from $35M to $21.7M in the Omnibus, this funding level will permit us to complete the design, the clearing of the trees from the facility footprint and begin installation of the necessary utilities, fencing and storm water controls,” Carr said. According to Fluor-BWXT they are projecting $154 million in barter in 2016. The company will carry over $20 million from the previous year, which equips the company with about $377 million in operating dollars. Carr attributed obtaining the level of funding to support from individuals and individuals within and outside of the plant. The spending bill also included $100 million for the continued operation of the American Centrifuge Plant in Piketon. The funding would be up to DOE to allocate the funding to Centrus Energy for continued operations or not. The $100 million set aside for ACP will be divided, $50 million in direct appropriations, which the Department had previously stated it would use to support critical centrifuge research and testing at Centrus’ facilities in Oak Ridge, Tennessee. The legislation also authorizes DOE to continue operating America’s only industrial-scale cascade of advanced centrifuges – located in Piketon, Ohio – by providing authority to use an additional $50 million from other accounts in the Department’s budget. It’s uncertain if DOE will fund the continued ACP operations in Piketon.